TORONTO, ONTARIO--(Marketwired - Aug. 16, 2017) - QMX Gold Corporation ("QMX" or the "Company") (TSX VENTURE:QMX) is pleased to provide an update on its plans for the Bevcon target area located 27 Kilometers east of Val d'Or, Quebec - on the eastern side of its extensive and contiguous land package (Figure 1). "This is an exciting point in time for QMX Gold and its exploration team, after more than a year of hard work compiling and analyzing a huge amount of historical data across a number of priority zones, we now have a significant pipeline of promising drill-ready targets. 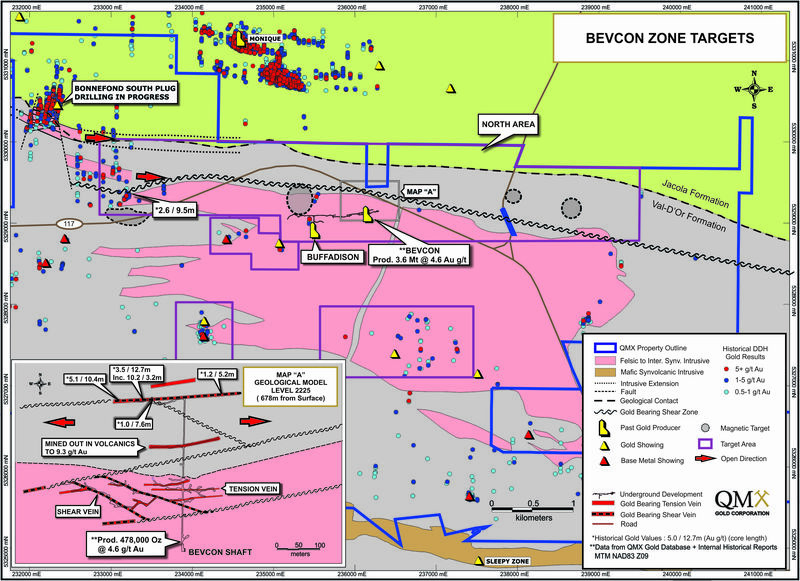 We continue to see favourable indications from our current drilling on Bonnefond South, continue to evaluate our recent successes on the Southwestern and Beacon zones for potential follow-up drill programs, and are now preparing targets at one of our most exciting projects, Bevcon." commented Brad Humphrey, President and CEO. "Our methodical and systematic approach towards exploring QMX Gold's highly prospective land package, across the heart of the Val d'Or mining camp is now bearing fruit with a healthy pipeline of exciting drilling opportunities." We anticipate drilling at Bevcon with an initial program of 5,000 meters before the end of August. The primary targets will follow extensions of the gold shear zones within the volcanic rocks north of the Bevcon intrusion and will test the presence of gold hosted plugs in this historically favourable structural and stratigraphic level of the Val d'Or mining camp (Figure 2). The target area covers the past-producing Bevcon Gold mine (from 1947 to 1965), that produced 478,000 ounces, the sixth largest gold mine in terms of production in the Val d'Or Mining Camp. This area has seen little exploration over the past three decades. Historical drilling within the volcanic rocks indicate the presence of gold shear zones which historically returned values of 5.1 g/t Au over 10.4 meters and 3.5 g/t Au over 12.7 meters including 10.2 g/t Au over 3.2 meters (QMX Gold DDH data base). Historically only limited work was conducted and this target remains open in all directions. The last drill program on the Bevcon target was completed in 1992. QMX Gold recently completed a compilation of all historical data, including 3-D modeling of the deposit, and is now preparing drill targets for an initial 5,000-meter diamond drill program. This program is expected to commence by the end of August. The known Bevcon gold deposit lies within the northern part of the Synvolcanic, quartz-diorite, Bevcon intrusion; which is highly altered and cut by numerous discrete E-W and N-W trending shear zones. The gold-bearing Quartz Tourmaline vein systems at the Bevcon Mine were mined over a strike length exceeding 1,000 meters and to a depth of 680 meters. Limited underground drilling encountered mineralization below the mine to the depth of 1,000 meters and the deposit is considered open further to depth. Mineralization also extends laterally to the west through the Buffadisson Mine (Figure 2). Interpretation of the original underground mine plans and sections in the QMX records confirms that Gold-bearing Quartz Tourmaline veins have very good lateral and dip continuity and occur in several orientations. Very high-grade, narrow veins most commonly trend E-W, dipping 10-30 degrees to the south; however shallow north-dipping and steep north and south dipping veins are also common. Within the mine a 200-meter vertical interval of almost stockwork-like veining was mined as a sub-horizontal slice across the strike length of the deposit. The density of the various vein sets in this block was sufficient to support bulk mining. An estimated 43% of mine production was from bulk mining. Vein systems and gold-bearing shear zones within the volcanic rocks to the immediate north of the mine workings, as opposed to solely in the Bevcon synvolcanic intrusion. Some developed areas have historical stope grades in the volcanics of over 9.0 g/t Au (Internal Historical Records). This environment is largely untested, lies proximal to the Dunraine shear and remains open in all directions. The northern part of the Bevcon intrusion is on trend of a potential eastern extension of the Bonnefond South Plug where we are currently drilling. The geological context is very similar to the Bonnefond South Plug and the Lamaque Project (Eldorado Gold, previously Integra) with the presence of gold-bearing shear zones and plug style intrusion hosted gold mineralization. Several areas along strike of the deposit to the south of the QFP dyke were drilled from underground and drilling intersected similar veining to that of the Bevcon mine. Additional gold zones have been highlighted within and along the margin of the Bevcon synvolcanic intrusion. 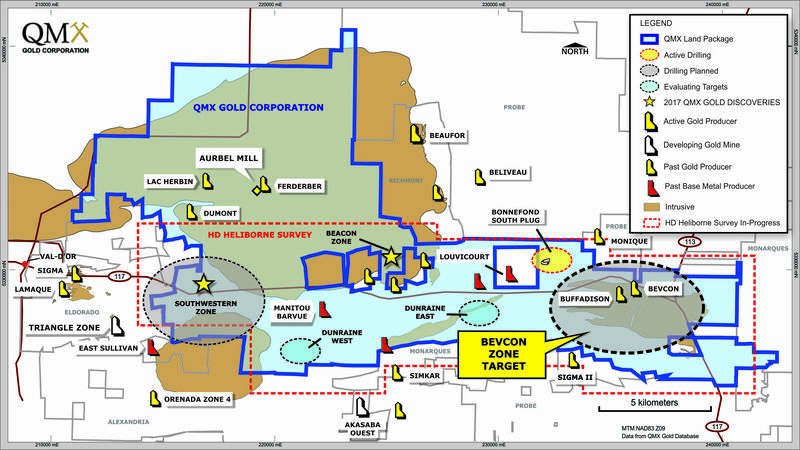 Each of these zones will be reevaluated in relation to the geometry of the gold mineralization known in the Val d'Or mining camp. The HD magnetic survey, which is underway, will help target the precise locations of these shear zones inside and outside of the Bevcon synvolcanic intrusion. This survey may also highlight the presence of Plug Style Intrusions in the northern part of the Bevcon synvolcanic intrusion. "Mining in Val d'Or commenced in 1932 at the Lamaque Mine. 60 years later, standing at the top of the observation tower near the centre of Val d'Or, at least twelve gold and base metal, mine head-frames were visible within the camp. Recent discoveries in the Val d'Or Mining Camp demonstrate the continuing economic potential of the area and highlight the intrinsic value of the nearly 200 sq. km. land package that QMX controls stretching for approximately 30 km through the central part of this gold- and base metal-rich area. This is again being demonstrated through our recent work near the Bevcon deposit." commented David Rigg, Senior Vice-President Exploration. The scientific and technical content of this press release has been reviewed, prepared and approved by Mr. David Rigg, P.Geo, Senior Vice President Exploration, who is a "Qualified Person" as defined by National Instrument 43-101 - Standards of Disclosure for Mineral Projects. QMX Gold Corporation is a Canadian based resource company traded on the TSX-V under the symbol "QMX". The Company was recently restructured and is now systematically exploring its extensive property position in the Val d'Or mining camp in the Abitibi District of Quebec. QMX is currently drilling on the Bonnefond South Plug and is evaluating its recent discoveries on the Southwestern and Beacon Zones in order to set follow up drill targets. In addition to its extensive land package, QMX owns the Aurbel gold mill. This press release contains or may be deemed to contain "forward-looking information" within the meaning of applicable Canadian securities legislation. Forward-looking information includes, but is not limited to, statements regarding the future plans, operations and activities, projected mineralization, comparison between historical and exploration targets, receipt of required permits and obtaining necessary financing, and the ability of the Company to continue as a going concern. Generally, forward-looking information can be identified by the use of forward-looking terminology such as "plans", "expects" or "does not expect", "is expected", "budget", "scheduled", "estimates", "forecasts", "intends", "anticipates" or "does not anticipate", or "believes", or variations of such words and phrases or state that certain actions, events or results "may", "could", "would", "might" or "will be taken", "occur" or "be achieved". Forward looking information is subject to known and unknown risks, uncertainties and other factors that may cause the actual results, level of activity, performance or achievements of the Company, its properties and/or its projects to be materially different from those expressed or implied by such forward-looking information, including but not limited to those risks described in the disclosure documents of the Company filed under the Company's profile on SEDAR. Although the Company has attempted to identify important factors that could cause actual results to differ materially from those contained in forward-looking information, there may be other factors that cause results not to be as anticipated, estimated or intended. There can be no assurance that such information will prove to be accurate, as actual results and future events could differ materially from those anticipated in such statements. Accordingly, readers should not place undue reliance on forward-looking information. The Company does not undertake to update any forward-looking information, except in accordance with applicable securities laws.